This is Rachel at 32 weeks….boy baby (according to the ultrasound) is weighing 5.2 pounds and little girl baby is weighing a modest 4.7. She is amazing, don’t you agree?? Glorious! 🙂 I love looking at pregnant pictures. Which reminds me that I need to get John to take some of me soon. I’m almost 23 weeks. This pregnancy is flying by. Rachel looks amazing. Will be praying for her in the home stretch. Absolutely lovely! And hurrah for twins! That’s 10 lbs of baby already! Praise God. And Rachel is just beautiful! Indeed. So is your fireplace/mantel (I love the red-pattern plate in the picture with the Baileys on your husband’s blog). Rachel painted that plate for me for Christmas a couple years ago. I like it too! Wow, Gorgeous! How encouraging that even an advanced twin pregnancy can look great. She is very beautiful. My mom had twin boys, but I was only five at the time so I don’t remember a whole lot. I do remember the doctor put her on bed rest the last two weeks or so before delivery. Amazing women, yes they are. You look great! I had boy / girl twins two years ago. Keep praying that those babies gain WEIGHT, the ultrasounds aren’t always accurate….I went into delivery at 35 weeks thinking I was going to have 6lb babies and came out with a 4.8 and a 4.13. BUT God is good, and tiny babies turn out to be chubby, healthy two year olds!! Congratulations, Rachel–you look great! 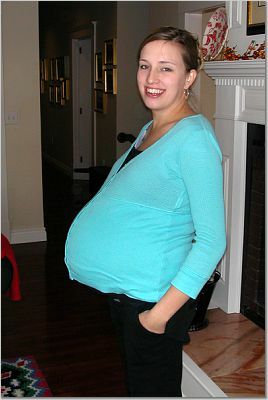 It’s even more amazing that from the front-view picture you barely look pregnant!! One more comment–as far as cute pregnant pictures go here’s a link to our friend’s blog site who’s just over the halfway point with her first. She’s a professional photographer and her picture reminded me of the Femina masthead. I hope I did that link right! 5.2 and 4.7 and 32 weeks away! I’m sure you have plenty of time to go beyond the 11 lbs. of one baby I had 18 years ago! You go, girl! You look radiant! And do please forgive my boasting. It was my first baby and I was so proud of my bountiful belly! Rachel looks fabulous! I’ve been wondering if there was news of what kind of babies she was growing. A boy and a girl, what fun! Hurrah! Praise God for growing babies. Yes indeed, Rachel looks beautiful, and so does that fireplace and mantle. The plate is just lovely also. What a blessing. I had twins 7 years ago, One of the happiest days of my life. I hope you enjoy every moment of it. 7 years later it is still one of the most amazing things. God bless you! You don’t even look swollen at all–all baby! I imagine you don’t even look pregnant from behind. Our triplets were all about 4 lbs each, and it was amazing to me that they could tell long before birth that we had two boys and a girl. Go Rachel!